Feelgood Health Congesto-K Crystals contain a selected blend of therapeutic essential oils and salts, especially chosen to clear congestion in the nose, sinuses and chest and to relax the body before bed. 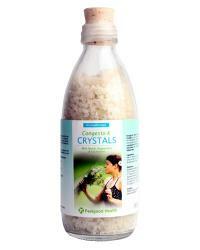 Ingredients: Neroli, Peppermint, Eucalyptus, Chamomile, Salts, Epson Salts, Bicarbonate of Soda. Directions: Sprinkle a handful under hot running water. May be used in the bath or in a vapour bowl placed in the bedroom at night. Caution: Safety during pregnancy has not been established.